JetWarbird Training in sunny Santa Fe, New Mexico has a sweet Aero Vodochody L-29 “Delfin” (the Dolphin). New Mexico is an excellent place to experience jet training! The JetWarbird L-29 was designed as a straightforward uncomplicated jet flying military trainer. With clear skies, seasonable weather and G airspace all makes the perfect opportunity to learn how to fly a jet; just slide into the front seat and you will think this L-29 was made just for you. The JetWarbird L-29 was developed in the 1950’s as a replacement to the Soviet Air Force WWII piston engine driven trainer and was implemented by Eastern Bloc air forces and built by Czech. Thus the L-29 was made relatively uncomplicated and simple but rugged, capable of operation on concrete and turf runways. Production of the L-29 began in 1963 and ran for eleven years producing over 3,600 L-29s. 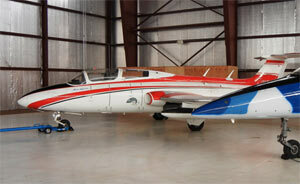 JetWarbird's L-29 is a tandem two seat basic and advanced jet trainer with straight forward flying characteristics. With a wing span of just less than 34 feet and height of plus 10 feet, speeds up to 345 Kts and maximum speed of 440 Kts, mach 0.7. The M-701c-500 turbo jet engine utilizes a single sided centrifugal compressor and a single stage axial flow turbine to produce a maximum 1955 lbs thrust and 155 lbs at idle. The JetWarbird L-29 incorporated an automatic engine fuel control system. With two external 79 gallon fuel tanks and two internal fuel tanks of 270 gallons, a usable 343 gallons you have approximately 2 hours of flying time & approximately 400 miles range. Santa Fe Municipal airport is located only nine miles from the historic district and has three runways. The shortest runway, 10/28, is 6300 feet long, runway 2/20 is primary instruction runway and is 8342 feet long. JetWarbird's L-29, unlike most modern jet fighter trainers can operate on a modest 4000 foot minimum runway length, leaving about 1000 feet remaining at lift-off. Normal 15 degree of flap for take-off and max (take-off) power, lift the nose at 76 KIAS, JetWarBird's L-29 will fly itself off the runway at 86 KIAS with about 3000 feet run. JetWarBird's L-29 has slotted Fowler flaps electrically controlled and hydraulically operated. 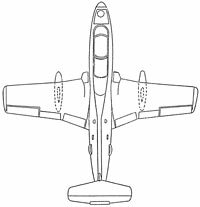 The JetWarbird's L-29 flap range is from 0 degree (cruise), 15 degree (take-off) and 30 degree (landing). With trailing link landing gears and general aviation high performance aircraft speeds, a general aviation pilot's transition to jets is relatively smooth. Jetwarbird's L-29 was designed with safety in mind with redundancy in hydraulics that operates the flaps, landing gear and speed brakes. The pressurized cabin is sealed with a rubberized seal; each cockpit has it own pressure sealing source. The ground brakes are pneumatic and hand operated, an emergency brake system is incorporated for additional redundancy; dual pitot system, caution and warning light panel, audible horns and flashing warning lights. Flying the JetWarbird L-29 is an experience; there is no better way to experience the feel and flight of a fighter pilot than to fly the JetWardBird L-29. From here the gauntlet has been laid down - you will want to experience the rush of the JetWarbird L-39, the classic Lockheed T-33 and maybe the fast and nimble Mig 15 in the skies of New Mexico….